Somebody else’s Sons & Daughters? Last year, Seven decided to roll out early episodes of their hit ’80s soap Sons And Daughters in a daytime timeslot. The revival – loosely timed to coincide with the show’s 25th anniversary and DVD release – was short-lived as no sooner had lovers John (Peter Phelps) and Angela (Ally Fowler) been revealed to be long-lost brother and sister, that the re-runs were taken out of the schedule. Fans could have therefore been excited to see the title re-appear in Seven’s afternoon line-up this week but would have since found that instead of the suburban Palmers and the snobby Hamiltons, there was an American sitcom which just happens to have the same title. 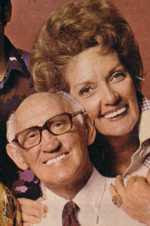 The US-styled Sons And Daughters was a short-lived production (only thirteen episodes) for commercial network ABC. For Australians the only familiar face among the cast list is Dee Wallace, best known for her role in the movie ET – The Extra Terrestrial. Pictured: Rowena Wallace, Pat McDonald and Kim Lewis from the Australian Sons And Daughters. 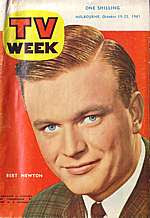 In over fifty years of Australian television, only one name has been an almost constant presence during that time – Bert Newton. Number 96: Where are they now..? Ever wondered what happened to the cast members of Number 96? Following from a recent reunion of cast members from The Young Doctors (1976-83), this week’s episode of Seven‘s Where Are They Now? features a reunion of former cast members of the saucy 1970s soap that was a ratings giant. Sadly, favourites like Ron Shand and Pat McDonald (pictured) are no longer with us, but it will be interesting if Seven concedes to feature possibly the only 96 cast member to still have a prime-time role on television, Tom Oliver from rival Network Ten‘s Neighbours. One of the largest takeovers in Australian regional television is set to unfold with Macquarie Media Group (MMG) making a bid to take over the media assets of Southern Cross Broadcasting (SCB). 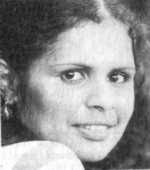 The Southern Cross Broadcasting empire, which began with two regional television stations in Victoria in the 1980s, has expanded to a network of television stations stretching from Hobart to Cairns, and across to Darwin – with its Southern Cross Ten and Southern Cross Television brands. It also controls Seven Central which serves outback centres such as Alice Springs and Mt Isa and via satellite to remote areas in the eastern and central timezones, and has half-shares in both Tasmanian Digital Television and Darwin Digital Television. SCB also recently sold its Adelaide television station NWS9 to rival regional broadcaster WIN. In the deal announced today, MMG has made an offer to the value of $1.35 billion for the media assets of SCB – primarily for the purposes of taking over the regional television outlets to supplement its existing network of 87 regional radio stations. MMG plans to offload the radio stations of SCB to Fairfax Media (publisher of newspapers The Age and Sydney Morning Herald) for a sum of around $480 million which will give Fairfax the talk radio network headed by 2UE and 3AW, and music stations Magic 1278 Melbourne, 4BH Brisbane and 96FM in Perth. Fairfax is also to acquire the production company Southern Star and music distribution business Satellite Music Australia. SCB shareholders are to vote on the offer in October, though the bid already has the support of the board of SCB. 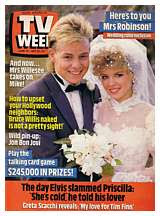 Hard to believe, but this Sunday 1 July marks the 20th anniversary of the famous Neighbours wedding of Scott Robinson (Jason Donovan) and Charlene Ramsay (Kylie Minogue). The Romeo-and-Juliet-type romance of Scott and Charlene, which essentially brought together the two neighbouring (and sometimes feuding) families in Ramsay Street, was a major drawcard during the show’s peak in popularity in the late 1980s. The episode was one of the show’s most watched ever – and created a chart-topper with the hit ballad Suddenly, sung by Angry Anderson, played during the wedding. Though no sooner had the honeymoon ended for the couple, the pair had been offered a house in Brisbane by Charlene’s grandfather Dan Ramsay (Syd Conabere). The storyline served as Minogue’s exit from the series, with Donovan following later. Though the characters were never seen again in Ramsay Street they were later known to start their own family. The wedding of Scott and Charlene would also become pivotal in a much later storyline. Almost a decade after the wedding, the Ramsay and Robinson families had once again been feuding and to resolve the conflict Helen Daniels (Anne Haddy) brought out the tape of the wedding to show both families in happier times. The families resolved their feud, and a relieved Helen would drift off to sleep – and peacefully passed away. Next month – 1 July at 8.00pm to be exact – marks the 75th anniversary of the launch of the Australian Broadcasting Commission (ABC), the national broadcasting service which took control of twelve existing radio stations around the country. ABC continued to develop and expand radio services through metropolitan and regional Australia and now at its 75th birthday it can claim five domestic radio networks (Radio National, Local Radio, ABC FM, JJJ and NewsRadio) spanning the entire geography of Australia – available either via AM or FM broadcast, via satellite and some stations also streaming on the internet. In 1954, ABC was assigned the responsibility to provide the national television service – initially with one television station in each of Sydney and Melbourne in 1956 with the early highlight being the Olympic Games from Melbourne. ABC later expanded television service to other capital cities and, from the early 1960s, into regional areas. Colour television arrived in 1975, and ABC’s first program in the bold new world of colour was the iconic rock program Countdown. In 1980, ABC began satellite broadcasting to remote areas of Australia via the international satellite Intelsat. Six years later, the satellite service was transferred to the new domestic satellite Aussat. On ABC’s 51st birthday in 1983, the Australian Broadcasting Commission became the Australian Broadcasting Corporation. On New Year’s Day 1988, ABC in association with the Nine Network and SBS produced Australia Live – a four-hour presentation to launch the bicentennial of European settlement in Australia. ABC expanded to 24 hour transmission in 1993, around the same time it launched its own international satellite channel Australia Television, taking the national broadcaster across the Asia-Pacfic region. Digital television got off to a modest start in 2001, and ABC and the second national broadcaster SBS are the only networks initially allowed to offer multi-channel services on the digital platform. ABC initially launched two digital channels, ABC Kids and Fly TV in 2002 but were later shut-down due to budget limitations. In 2005, ABC made a renewed entry into multi-channel television with the launch of ABC2 – providing a mix of original and time-shifted content from the main ABC channel. ABC has launched its 75th birthday website and is definetly worth a look. It includes audio and video clips of historic moments of ABC radio and television. 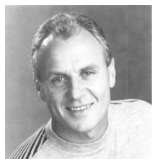 Despite his growing profile as an actor in the United States with roles in some of the country’s most popular series, Alan Dale still can’t quite shake off the stigma of being ‘Jim Robinson’ in the veteran Aussie soap Neighbours – a role which he departed almost fifteen years ago. So much is he still associated with the character in the United Kingdom that Dale now appears in the latest series of station promos for UK commercial network Channel 4. In the promo which debuted earlier this week during the launch of the latest series of Big Brother, Dale is discussing his acting career in a mock interview, only to be interrupted by an Aussie fan recognising him as Jim Robinson. The promo is among a series of tongue-in-cheek advertisements for the channel featuring a number of faces familiar to British viewers. Dale, a former New Zealander who became known in Australia for his role in the soap The Young Doctors, was part of the original cast of Neighbours when it began on the Seven Network in 1985 and continued through the series’ halcyon days heralded by young co-stars Jason Donovan and Kylie Minogue. He left the series in 1993 and with his wife Tracey, a former Miss Australia and television presenter, went to the United States where he scored roles in series such as The OC, Lost, 24 and Ugly Betty. For 42 years, Rosemary Margan has been a consistent, if not understated, voice on Melbourne radio and television – presenting weather forecasts and commercials and was also a long-standing presenter at TV Week Logie Awards nights in the 1970s. But now, just short of her 70th birthday, the gentle voice of Rosemary is being retired from the airwaves with her final live-to-air appearance on radio 3AW. A former water-ski champion, Rosemary’s television career began at GTV9 in 1965 presenting the nightly weather forecast – causing a storm of her own when one night she appeared on-air in a fur coat which was removed to reveal her wearing no more than a bikini. 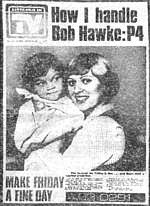 A decade later, Rosemary was presenting a live-to-air commercial on The Graham Kennedy Show when her spiel was interrupted by Graham’s suspect “crow call” which created headlines and got him banned from appearing on live television. For almost 20 years, Rosemary has been the voice of live-to-air commercials on Neil Mitchell‘s morning program on 3AW. In most parts of the country the telethon is only a fading memory – there was a time when each city, and even some regional areas, had at least one telethon aired during the year. A lot of these have long gone but a few still remain. Perth’s TVW7 still produces an annual telethon – raising funds for local children’s charities since 1968. The TVW appeal has raised over $73 million since its inception. In Melbourne, the Royal Children’s Hospital Good Friday Appeal has been an annual tradition since 1931. The appeal began as a sports carnival hosted by newspaper The Sporting Globe (published by the Herald and Weekly Times). Just over a decade later, radio station 3DB (also of the Herald Weekly Times group) joined the appeal. Television arrived in Melbourne in 1956, and the new Herald and Weekly Times television station HSV7 conducted its first telethon in 1957 in association with 3DB and The Sporting Globe. Even when all three media outlets were split up to separate owners in 1987, the Good Friday Appeal continued between them. It is only in 2007 that the first major change in the partnership has occurred with Southern Cross Broadcasting (radio stations 3AW and Magic) taking on the radio component of the Appeal, effectively ending a 65-year relationship between the Good Friday Appeal and 3DB (then 3TT, TTFM and Mix 101.1) The telethon also has the support of regional Victoria through the co-operation of Prime Television relaying and contributing to the HSV7 broadcast. The appeal has continued with overwhelming support – usually breaking record totals every year. In 1968, the Appeal raised $400,000. Less than a decade later, the first $1 million final total was reached. In 2006, over $10 million was raised to fund research and major projects at the hospital. In total, since 1931, over $160 million has been raised for the hospital – enabling it to maintain its reputation as a leading paediatric hospital. Update @ 12.05am 7.4.07: The 2007 Royal Children’s Hospital Good Friday Appeal has signed off with a record total of $11,788,970.87 – exceeding last year’s total by over $1.5 million.